See When words are both true and kind, they can change our world. This one has been found attributed to the Buddha in a number of books, blogs, Facebook posts, quote sites, graphics, and so on. To anyone familiar with the Buddhist scriptures it’s quite clearly fake. You must love yourself before you love another. By accepting yourself and fully being what you are, your simple presence can make others happy. You yourself, as much as anybody in the entire universe, deserve your love and affection. Thanks to a reader called Rory for bringing this one to my attention. The second part is a Fake Buddha Quote from Sharon Salzberg, which I’ve dealt with elsewhere. For the first part of the quote, I found a link to a New Age author called Jane Roberts, who claimed to be channeling some entity called “Seth.” No offense to any Seths out there is intended, but that strikes me as being a rather lame monicker for a spirit guide. It’s better than Nigel or Brian, though, I suppose. Incidentally this isn’t the only fake Buddha quote that was dictated by a spook. “When the student is ready, the teacher will appear” is another. You must first love yourself before you love another. By accepting yourself and joyfully being what you are, you fulfill your own abilities, and your simple presence can make others happy. On a website called Metabunk, which debunks fake quotes, Rory shared the origins of the two quotes and he also (bless him) showed that the two quotes were probably combined as a result of someone misreading a 2012 Psychology Today blog post on “The 50 Best Quotes on Self-Love.” The quotes are found listed together, with the first being unattributed and the second attributed to the Buddha. Presumably someone copied these and combined them, not noticing, or perhaps not caring, that they were originally separate. You’ll notice that in the Psychology Today article the first quote lacks a period so that the two quotes are run together ungrammatically. The AZ Quotes (or Lazy Quotes) graphic above faithfully maintains this error. It’s taken me a long time to get around to tackling this old chestnut. What prompts to me write today is a discussion on Google+ where this supposed quote cropped up. In this discussion, someone of a Taoist persuasion referred to the Buddha having said that life is suffering. He referred to Benjamin Hoff’s “The Tao of Pooh,” in which there is a story about Confucius, the Buddha, and Lao Zi, tasting vinegar—which represents, we are told, “the essence of life.” Confucius has a sour look on his face because the heavens and earth are out of balance, the Buddha wears a bitter expression because “life on earth was bitter, filled with attachments and desires that led to suffering,” but the Lao Zi is smiling because he accepts that sourness is a part of life. The most ironic one of these is the BuddhaNet article on “Common Buddhist Misunderstandings,” which tries to prevent people misinterpreting the Buddha’s supposed statement that “Life is suffering” by pointing out that it “should not be generalised to “all life is suffering.” But the true “common misunderstanding” is that “life is suffering” is not something that the Buddha ever said. And yet you’ll find this statement everywhere. Indeed! 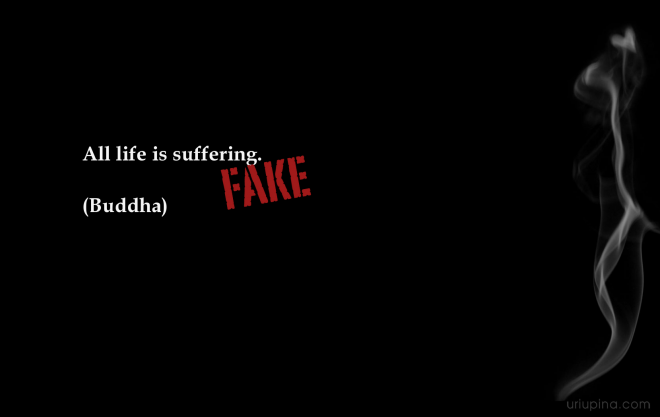 The Buddha never said that “life is suffering,” just that there is suffering in life. His teaching is about accepting inevitable suffering (the vinegar) with grace and with a peaceful mind, while allowing joy to arise naturally when conditions allow. So there are a lot of things here that are pointed to as being sources of suffering—in life. But life itself is not one of them, and it’s pointed to as necessarily involving suffering. And nowhere—not in that scripture or in any other—does the Buddha said that life is suffering or that everything is suffering. The Buddha seems to have believed (although he didn’t say it directly) that some kind of pain was inevitable in life, and that the thing was to learn to accept it gracefully. The teaching of the Two Arrows is on that very theme. It illustrates the difference between how the “untaught worldling” and the “well-taught noble disciple” respond to pain. The first grieves and laments, or tries to escape suffering through the pursuit of happiness, and in doing so merely causes themselves more suffering. The latter accepts suffering without reacting: that is, without lamenting or trying to escape. The Buddha not only didn’t see life as suffering, but he saw life, well-lived, as a source of great joy. Pleasure and happiness are important components of the path to awakening. They are part of the process of meditation, arising naturally as distractions fall away from the mind. One problem is that usually by the time people start reading the Buddhist scriptures, they have read dozens of books on Buddhism. 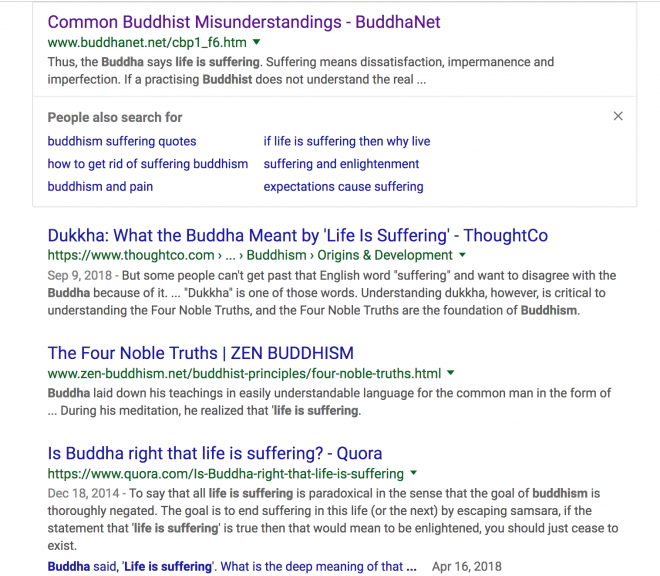 Those books say that the Buddha said “Life is suffering” (and a whole bunch more false ideas besides) and those ideas take root in the mind to such an extent that often by the time people encounter the scriptures their pre-existing ideas become a powerful filter through which they interpret everything they read. They can’t see what is actually there, and their preconceptions remain unchallenged. I wish I could find an original source for this quote, but unfortunately I haven’t been able to. I’m 100% sure that this does not come from any Buddhist scripture, but is of very recent vintage. I’ve found it in a couple of books, but the oldest of these is a self-published work called “Inspiration to Mankind,” by Bendalam Krishna Rao . This book is a collection of quotes attributed to the Buddha — many of them fake. There is no publication date in the book itself, but based on information in Google Books and Archive.org I believe it was published in 2014. If you find any earlier references, please let me know. So at the moment I’ve no idea where this quote is from, who wrote it, or how it became attributed to the Buddha. The only thing I’m confident of is that the Buddha never said it. The Buddha was a fan of silence. He said to his monks that when they gathered they should either talk about Dhamma (the teachings) or remain silent. the wise one’s like a lake that’s full. There’s much mention of space in the scriptures, largely because there is a meditative attainment called “the sphere of infinite space.” That’s not described as being the home of the awakened, however. In fact the Buddha found it unsatisfactory.